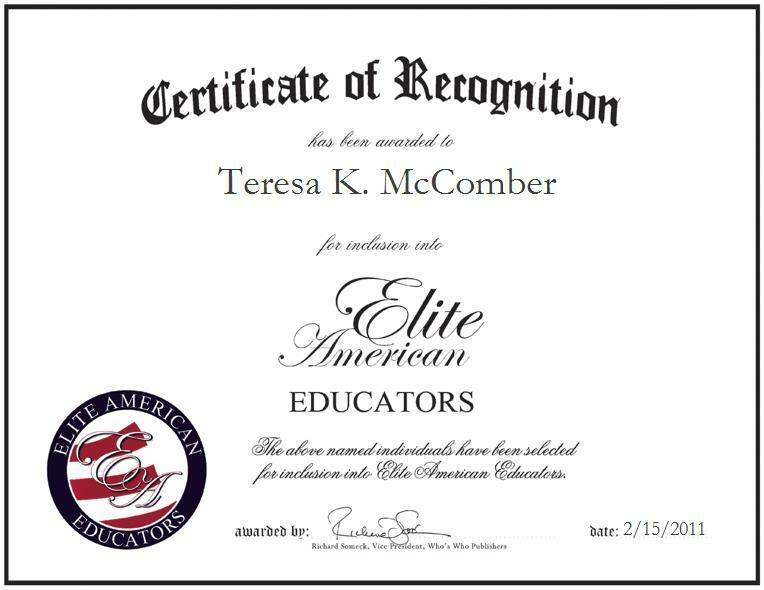 Allyn, WA, February 15, 2011, Teresa K. McComber, Mathematics Teacher for North Mason High School, has been recognized by Elite American Educators for dedication, leadership and achievements in secondary education. The recipient of a State of South Dakota Presidential Award for Excellence in Mathematics Teaching, Ms. McComber has devoted the last 23 years to the field of education. She specializes in mathematics instruction at North Mason High School. As a teacher, she is noted for her dedication to her students’ progress, doing what she can to ensure that they have the tools they need to excel academically, as well as personally. She attributes her success to her commitment to keeping abreast of industry developments and earnest desire to make a difference in the lives of children. Ms. McComber earned a Master of Science in teaching in 1997 from the University of Wyoming. A national board certified mathematics educator, she maintains active affiliation with the National Council of Teachers of Mathematics and the Council of Presidential Awardees in Mathematics. When she is away from her professional duties, Ms. McComber enjoys camping, hiking, and gardening.